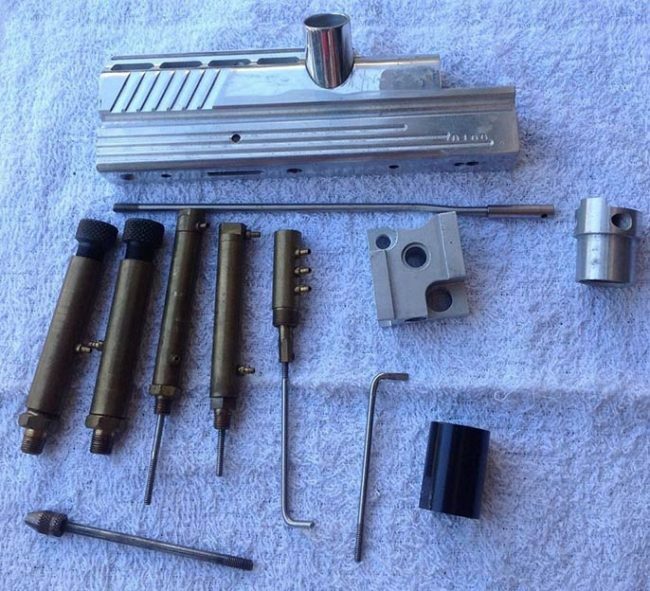 Coleman’s Autococker as pictured on ebay with various classic parts. Photo courtesy John Coleman. 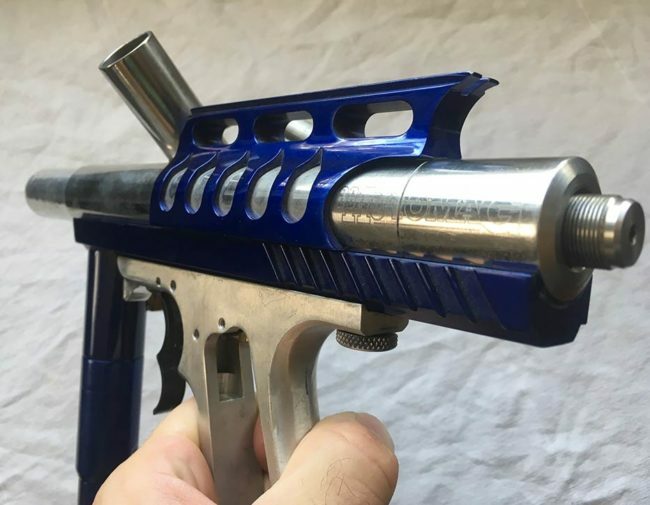 Left side of John Coleman’s Autococker. 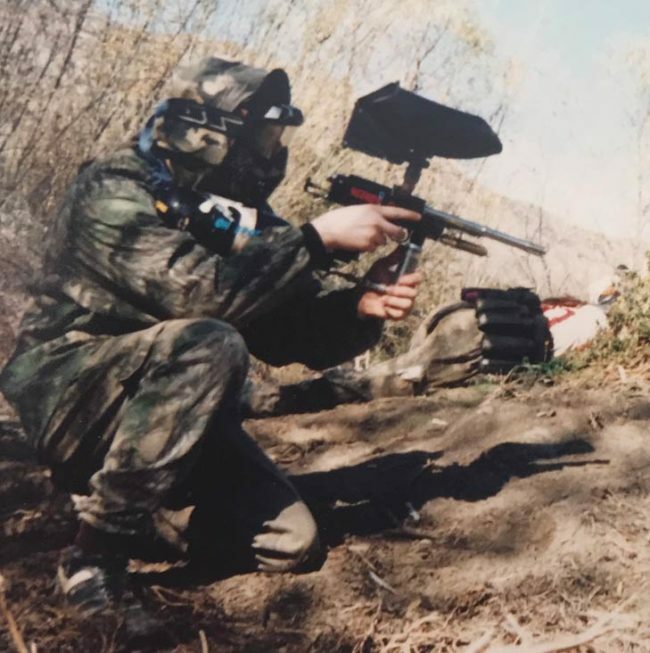 As pictured in John’s Ebay photo. Photo courtesy John Coleman. The cuts were done nicely, and the cocker featured a vent hole in the breech which made me more curious about the seller’s background. I emailed the seller and he explained that the cuts were done while he was employed by Earon Carter at Carter Machine in Fullerton, California. I eventually won the auctions and arranged to meet with the seller, John Coleman. 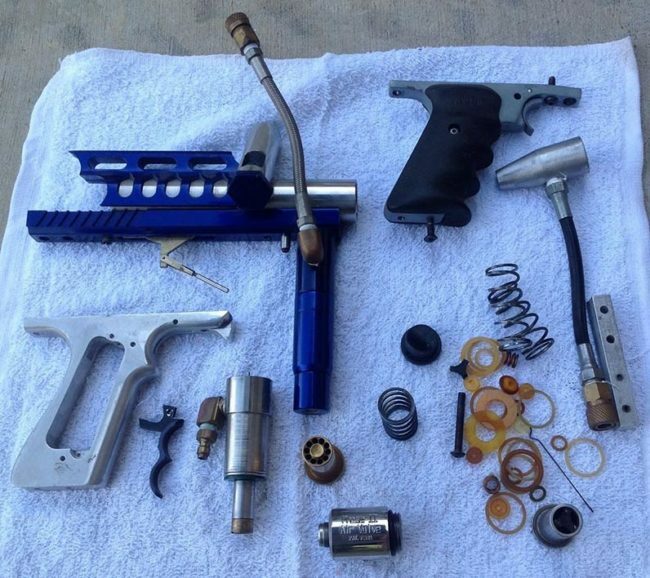 John Coleman’s Automag disassembled as pictured on ebay. Photo courtesy John Coleman. I visited John “Little John” Coleman on Thursday, May 27th, 2017. 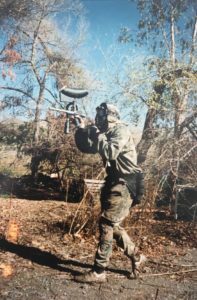 Coleman has an interesting history in paintball with long ties to the Bushwackers and later working at Carter Machine and Dye before Earon and Dave relocated production to San Diego. Bushwacker patch. Received indirectly from Ron Kilbourne through Paul Yun. Coleman started playing with the Bushwackers around 1986/87 when his friend and eventual teammate, Paul “Fridge” Mackay, invited him out to play at Field Games. Field Games was located close to Sat Cong Village (SC Village) and was the Bushwackers home field, run by team captain Ron Kilbourne (who was possibly a part owner along with Gale Gough of Aerostar). With an Adventure Games Supply (AGS) store located a few minutes from his home, John purchased an AGS Devastator. 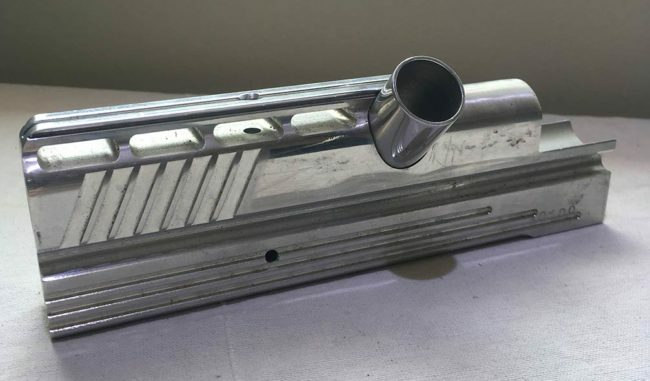 At the time, the AGS Devastator was likely the cheapest direct feed Nelson available, with bodies made by Sigma Precision for AGS, Line SI and others. 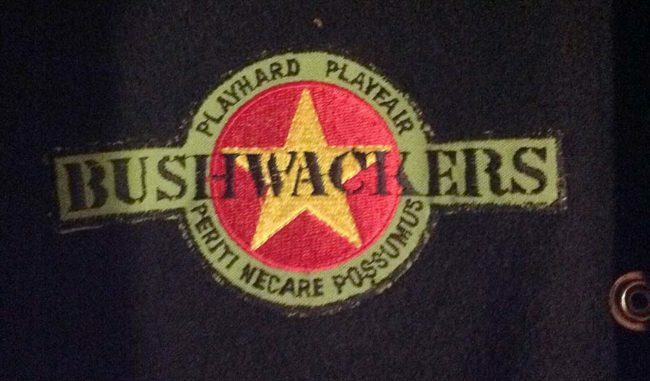 The California Bushwackers logo on the back of Bushwacker patch on the front of John Coleman’s Bushwacker letterman jacket. Photo courtesy John Coleman. 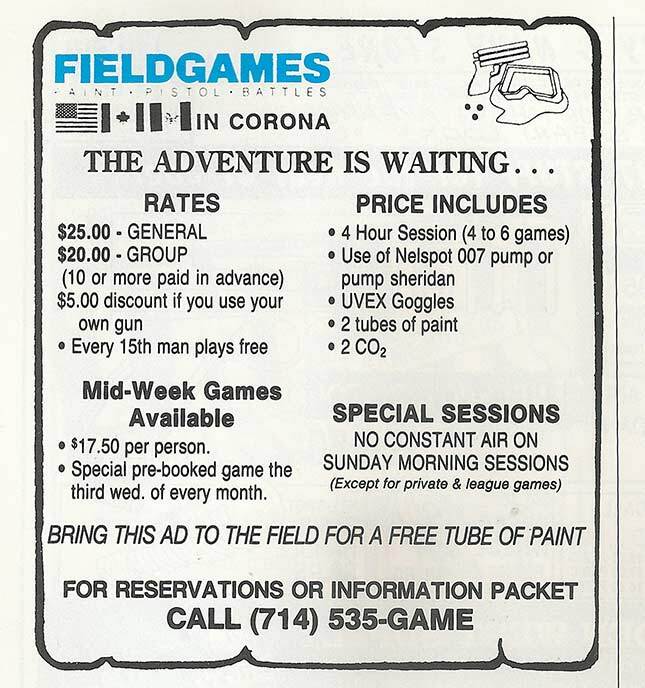 Ad for Field Games published in Front Line magazine in September 1987. 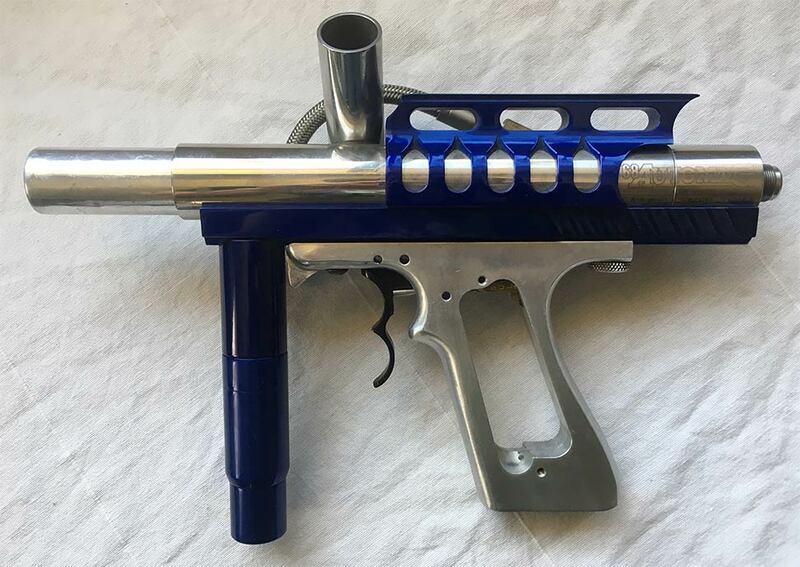 John Coleman’s Aerostar Assassinator 2 with battle grips and drop out changer. Photo courtesy John Coleman. John later sold his Devastator to buy an Assassinator II and then moved to a series of Line SI pumps after that. 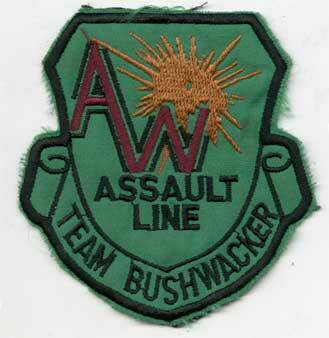 Early Bushwackers’ patch, sponsored by Assault Line. Bushwacker patch on the front of John Coleman’s Bushwacker letterman jacket. Photo courtesy John Coleman. Over the course of nearly a decade years, from 1986/87 until about 1994/1995, Coleman played on and off with the Bushwackers. John remembers, [At 13, when I] first started playing I was on the B [team] obviously.” But as he got better he moved to the A squad. John Coleman’s JT USA Line SI Bushmaster with sight rail engraved for the Bushwackers and player John Van Amburg. Photo courtesy John Coleman. JT USA Line SI Bushmaster c.1990? Around 1990 Kilbourne secured a small run of JT USA engraved Bushmasters for the Bushwackers. John remembers that these “Originally came with both valve bodies”, the CA valve and the 12 gram lever changer. Close up of right side of JT USA Bushmaster with Bushwacker engraving on sight rail. Photo courtesy John Coleman. 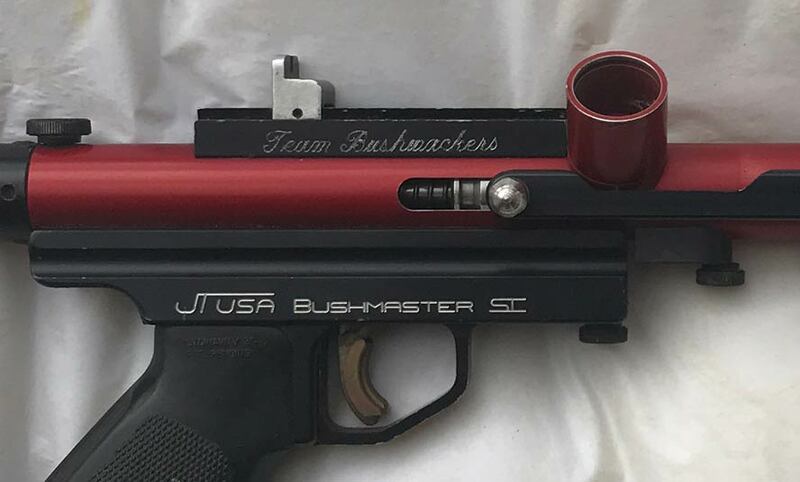 Left side of John Coleman’s JT USA Line SI Bushmaster with sight rail engraved for the Bushwackers and player John Van Amburg. Photo courtesy John Coleman. 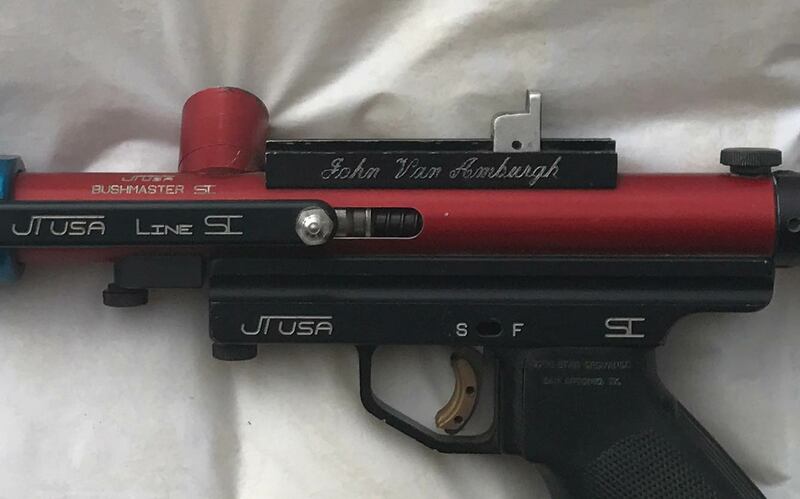 John was able to trade a Line SI Pointman for ‘Wacker teammate, John Van Amberg’s, JT USA Bushmaster. Van Amberg was leaving paintball. Van Amberg’s name is engraved on one side of the top rail (as pictured). Close up of left side of JT USA Bushmaster with John Van Amberg engraving on sight rail. Photo courtesy John Coleman. Coleman recalls that he “changed out the springs” and that was about it. The bolt and hammer set up in this JT USA Line SI Bushmaster was a stainless anti kink set from Lapco so it’s possible the powertube is stamped LA, for Lapco, and not SI. These internals were in it when it was purchased from Van Amberg. 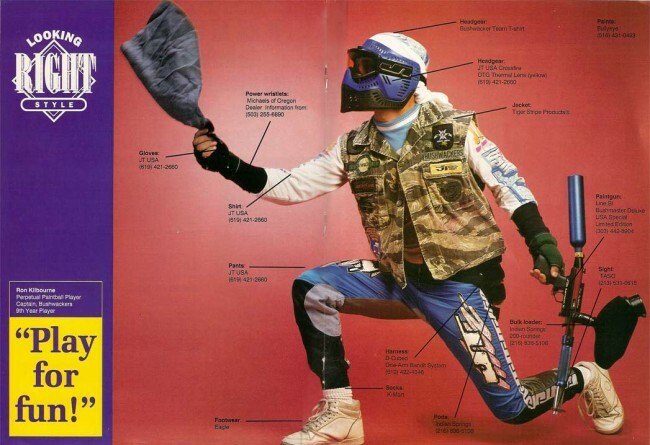 Ron Kilbourne in Paintball Magazine with pictured Vest. Scanned from the July 199_ issue of Paintball magazine. (I can’t find my notes on the year so I’ll fill this in once I’ve check the magazines). John Coleman playing with his Minicocker at Indoor Warfare (?) in Gardena. Wearing pullover Tiger Stripe with Black Sleeves. Photo courtesy John Coleman. Around the early 1990s, as semis were beginning to make their way onto the scene, John purchased an early plain black Autococker with the full back block and began using that instead of the JT USA Bushmaster. Coleman shooting Fridge’s Autococker while playing with the Bushwackers. Fridge in background laying down. John writes, “I’m sure it was walk on play or practice because that’s the only time I wore a full set of goggles. 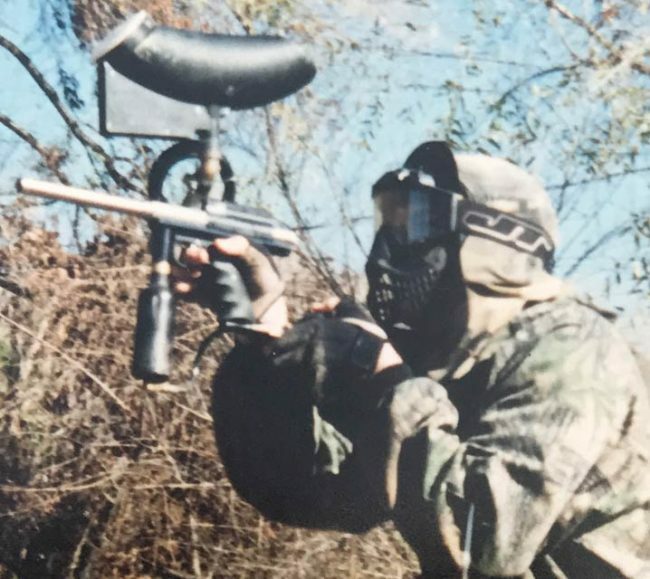 In tournaments we just wore the top [frame] until they made it mandatory for a full mask. 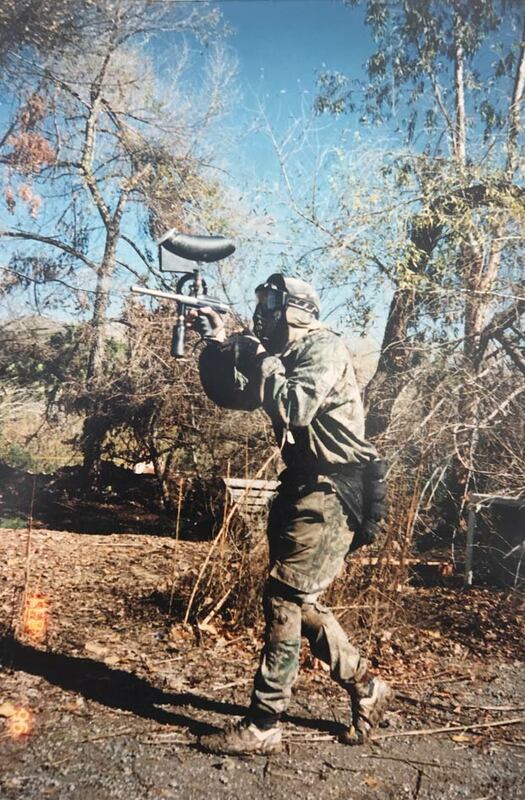 I would guess because no shroud [is pictured] on gun and [the] mossy oak camo ]that this photo] was at least 93/94. 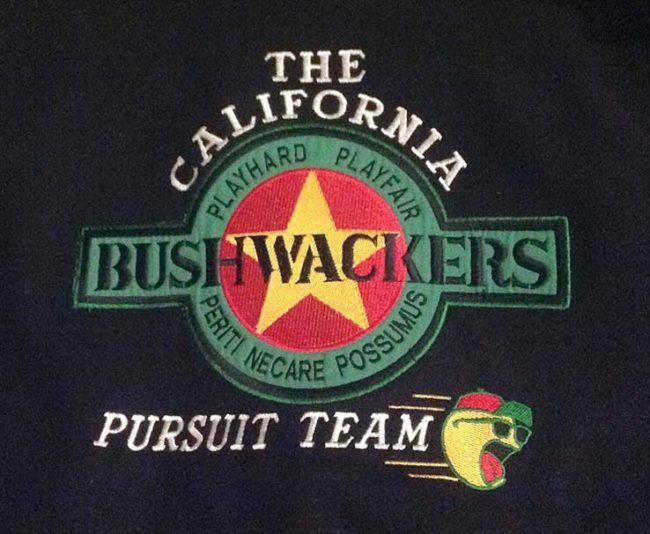 Pretty sure mossy oak was not a sponsor [of the Bushwackers] until [the] 93 season.” Photo courtesy John Coleman. 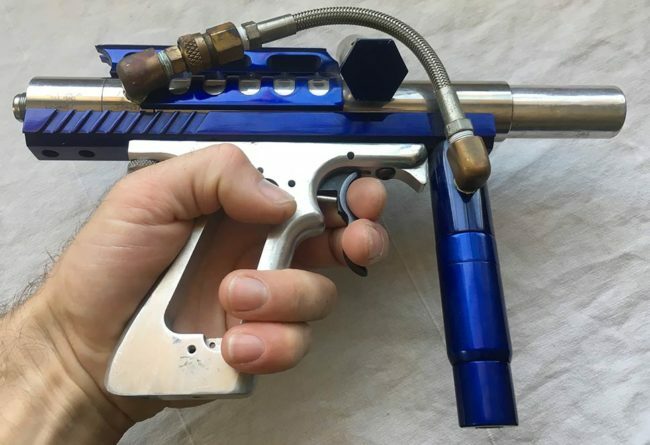 From this paintgun John moved to a Minicocker and then an Automag he purchased from Kilbourne. Both were used during his time on the Bushwackers. Close up on Coleman with Autococker and VL3000. Photo courtesy John Coleman. 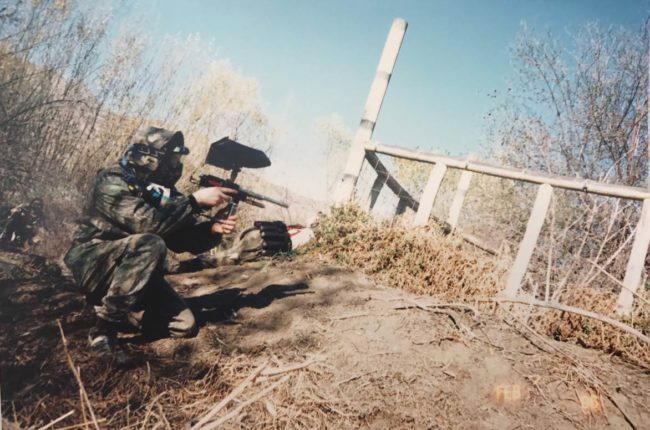 John Coleman shooting his Automag while playing on the Bushwackers in the early 1990s. Photo courtesy John Coleman. Regarding this photo John writes, “That black sight rail in the pic is the one I machined later that you have now. Looks like one of my j&j barrels, I had several since they were a sponsor.” Photo courtesy John Coleman. Around late 1995 to early 1996, as John was 22, he was offered an opportunity by friend and Bushwacker teammate, Aaron Christopher. Right side of John Coleman’s Automag cut at Carter Machine c.1995-98. The position at Carter Machine quickly required more of John’s schedule. “And then I remember when I went in the next day, [one of the previous employees] was gone. So within like a day it was like I went from coming in one or two days a week to full time. Left side of John Coleman’s Automag cut at Carter Machine c.1995-98. Back end of John Coleman’s Carterized Autococker. 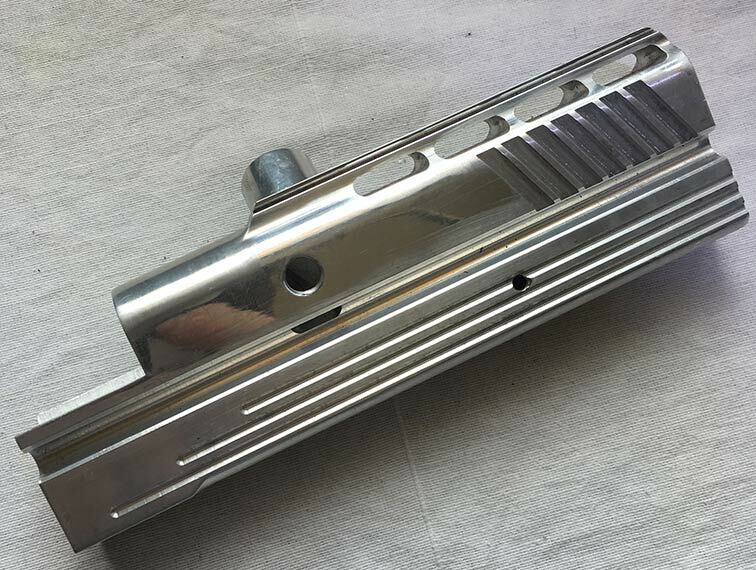 Scoop added to sight rail. 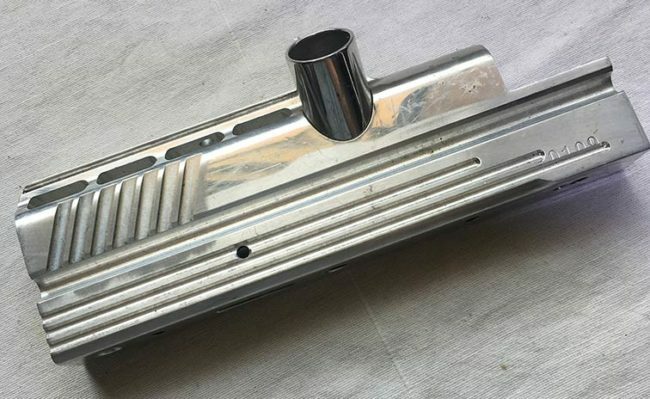 John Coleman’s Autococker body with 30K range serial, cut at Carter machine. Left side view, c.1995-98. Are these Carter Machine Guns? 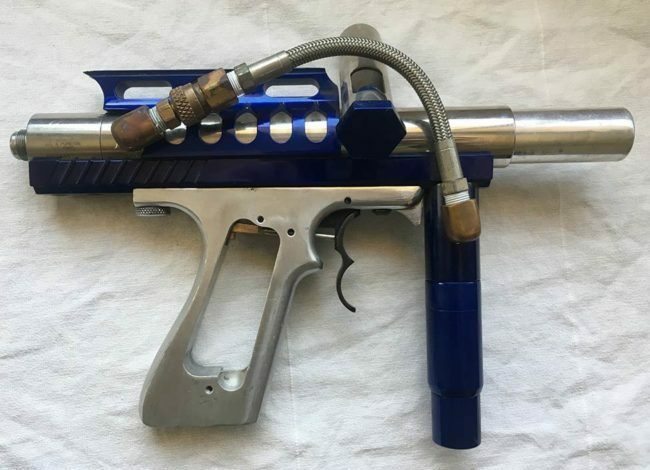 On John’s ebay auctions for his Autococker and Automag he didn’t indicate these paintguns were machined by Carter Machine. John Coleman’s Autococker body with 30K range serial, right side, c.96. 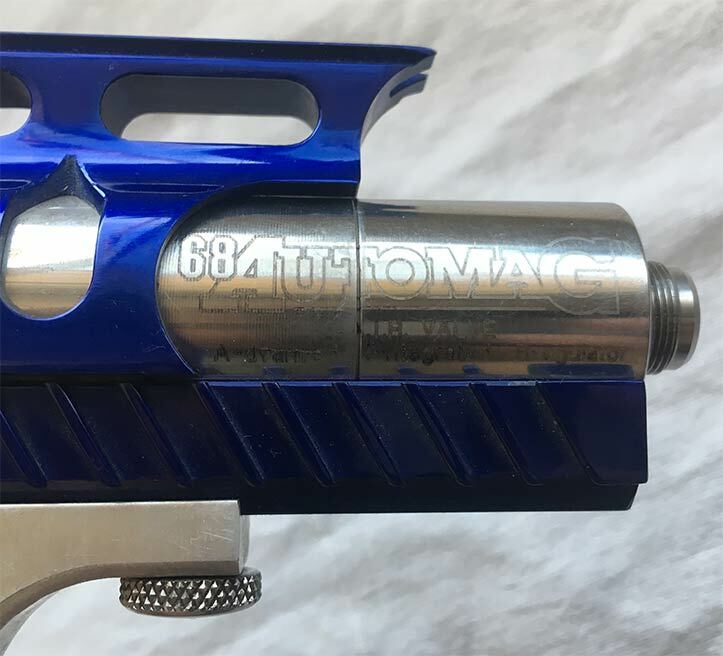 Right side of Coleman’s Autococker body. 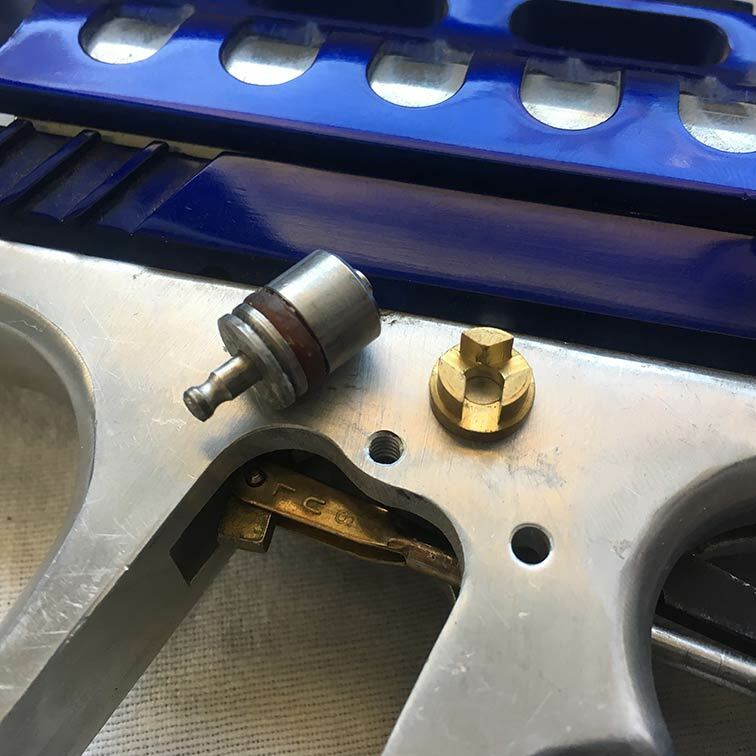 68 Automag valve on Coleman’s Automag. Coleman took the same approach when modifying his Automag. Cuts on the sight are stylistically similar to the Automags that Carter Machine was cutting at the time but unique (and possibly wider? ), and the unique rail cuts match the rail cuts on Coleman’s Buzzard. John told me that he could “only remember a couple [Automags] coming into the shop,” during his time there. “I was already not playing semi by the time I was working at Earons [and to] people that know my guns from the Bushwacker days it was a plain Automag, it didn’t look anything like this,” he explains. On / Off Top that Earon Carter recommend John Coleman cut while at Carter Machine. Cuts on rail and sight of John Coleman’s Automag. John Coleman’s Buzzard built at Carter Machine around 1996. Photo courtesy John Coleman. 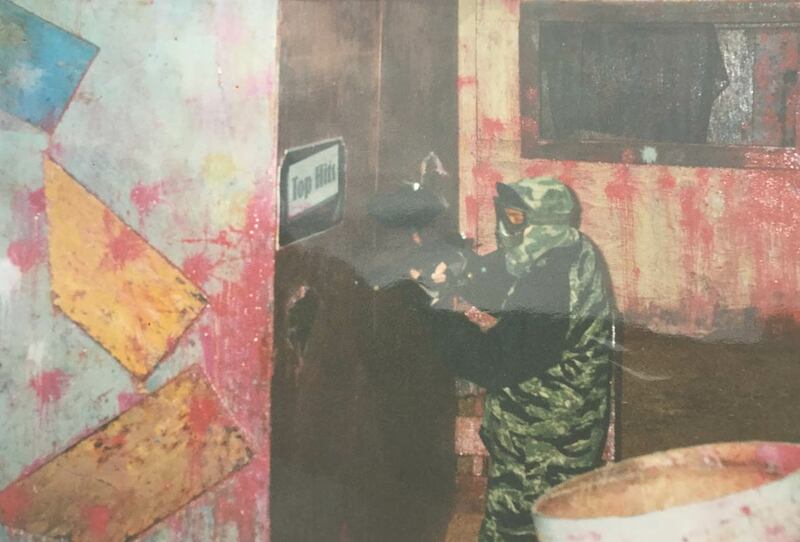 Between 1996 and 1997 Earon demanded that if John worked for Carter Machine he started playing stock class. “I had pretty much stopped playing tournament paintball so I wasn’t playing [as often]. [And] Earon’s very funny, one of the things he told me [was] “Hey you need to go play stock.” And I said, “I don’t want to go play stock,” and Earon said, “Maybe you didn’t understand me, you need to go play stock. And you can’t work for this shop and show up with a piece of crap, so you’re gonna make yourself a gun,” and that’s how [my buzzard] came about, but i had to make it. [Earon] wasn’t gonna give me one. But part of the deal was, when I made that gun, I made 4 or 5 other pieces of every [component] on there so I basically put together a batch of 5 or 6 guns. Of course my cuts were different than [the rest of the batch], but that was the deal. [Earon] was gonna give me the stuff to make it but I had to machine it,” said John. Early Carter Machine Comp and Buzzard internals rust and are supposedly “hard rolled” steel, so I asked John about the Nelson internals while he worked at Carter Machine, “I never knew [Earon] had anything different [than stainless internals for Comps and Buzzards],” he told me. John remembers reffing the 1996 SC Village Carter Invitational and then competing at the 1997 Julian Carter Machine Invitational. Towards the end of 1997 or early 1998 Dave purchased a CNC Machine which allowed John to catch up on barrel orders. Shortly after, in 1998, Earon moved production of Carter Machine and Dye to San Diego. 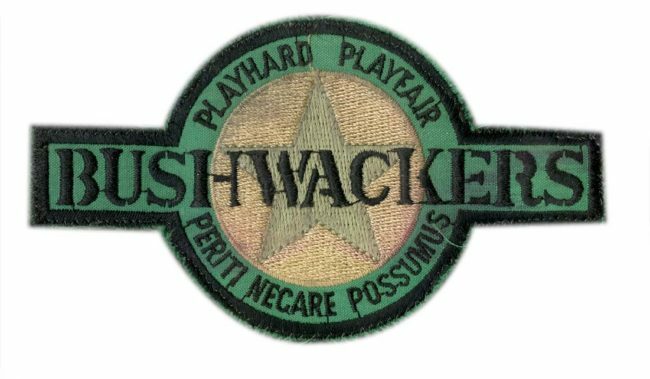 John offered more insight on Bushwacker patches and Dye barrel production that I will detail in future articles. Giant thanks to John for spending several hours with me talking about his paintball history. awesome read dan! just curious did carter machine the original DYE cockers?